Eelgrass beds placed at the bottom of Newport Bay might provide answers on fighting ocean acidification. NEWPORT BEACH — Could a long, slimy piece of grass be used as a defense against the potentially harmful effects of climate change? Researchers who are conducting a study for Orange County Coastkeeper hope the answer is a resounding yes. 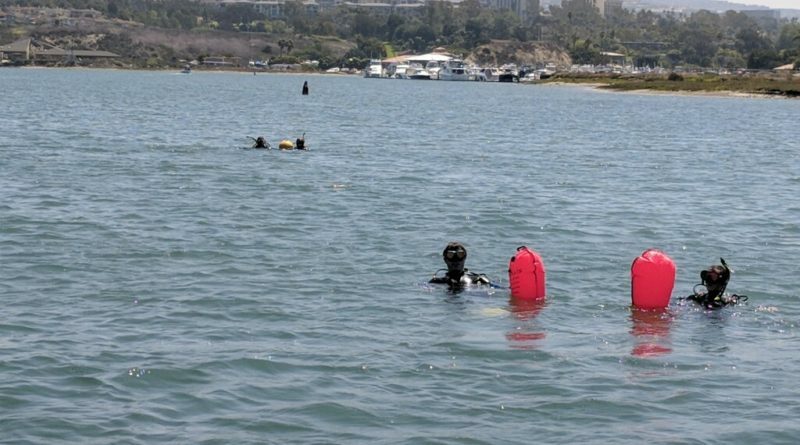 Scientific divers jumped into the waters of Newport Beach’s Upper Bay on May 29 to retrieve water sensors; the sensors, researchers hope, could demonstrate how beds of eelgrass could be used to battle ocean acidification. Eelgrass – or seagrass – would serve as a buffer to ocean acidification thanks to the high amounts of photosynthesis it produces. Ocean acidification alters the chemistry of the Earth’s waters by absorbing high levels of carbon dioxide – a process scientists believe can be reversed by the photosynthesis properties of eelgrass. The scientific dive team discussed the Upper Bay study during their May 29 demonstration at Back Bay Science Center. Nichols, who said she would be sampling water weekly, added the underwater sensors in the Upper bay would help determine whether there is a difference between natural and restored eelgrass. The marine restoration director added she expects seasonality to have less of an effect on eelgrass in Southern California, as compared to the efforts in Northern California. The data collected by researchers at Newport Bay is part of a larger project spearheaded by scientists at U.C. Davis and U.C. Santa Cruz. Surveys are being conducted at multiple bays across California to determine answers to several questions, such as whether eelgrass serves as a buffer to ocean acidification across multiple seasons and years (and, if so, to what extent). Is the water’s chemistry altered as it flows through eelgrass? If so, how are organisms living within and without eelgrass modified? Is carbon being trapped and stored in sentiments (and to what extent, if yes)? Is there a difference in the effects on carbon by natural eelgrass versus restored eelgrass? It is unclear whether the reliance on restored (as opposed to natural) eelgrass to provide marine life with relief from higher carbon dioxide levels in the water would work on a global scale, according to a July 2016 article published by Yale Environment 360. “The general response to such [ocean acidification defense] plans usually ranges from head-shaking disbelief that they might be feasible or effective, to widespread concern about the possible ecological side effects. The energy needed to mine and distribute rocks, and the unpredictable shift in food webs, have made these schemes unappealing on a global scale,” Nicola Jones wrote in her Yale Environment 360 article. “On the local scale, however, lower-cost, lower-risk ecological restoration might have the dual benefit of giving threatened sea creatures both a better place to live and a refuge from ocean acid,” she continued. Seagrass/eelgrass might serve as one nature’s greatest defenses to climate change, Davis said, but other factors are preventing the underwater plant from thriving. Researchers here in Newport Beach are certainly hopeful to prove the restoration of eelgrass in the city’s Upper Bay would ultimately fight back against ocean acidification. Whether future studies would be conducted is contingent upon funding, Nichols said. It is also unclear whether restoration efforts would be expanded to cover more areas off or along the Southern California coast.